Days before Israel's 62nd Independence Day anniversary, El Al unveiled a 767 Boeing plane named Daliyat al-Karmel, after Israel's largest Druze community. 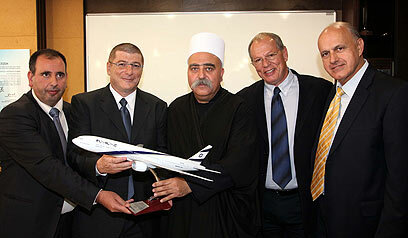 In a special ceremony, El Al CEO Eliezer Shkedi presented Shiekh Muafak Tarif, leader of the Druze community, with a miniature model of the plane. El Al chairman Amikam Cohen, Israel Prize winner Kamal Mansour and Druze dignitaries also attended the event. The Daliyat al-Karmel plane is slated to take part in the El Al Independence Day air show together with the rest of the airline's aircraft named after cities and communities in the country, including Kiryat Shmona, Sderot, Tel Aviv, Jerusalem, Beesheba, and Ashkelon. "El Al has decided to salute members of the Druze community in Israel on its 62nd Independence Day," Shkedi said. "The 767 Boeing plane to take part in a air show over the Israeli skyline was named after Daliyat al-Karmel as a symbol of true partnership and deep appreciation for the Druze community, on behalf of El Al staff and citizens of the State of Israel." Daliyat al-Karmel Council head Kamal Nasser Aladin said during the ceremony that the Druze community sees itself as part of the State of Israel's mosaic of activism. He noted that the gesture was a source of great pride for the community, particularly on the eve of Israel's Independence Day. See all talkbacks "El Al honors Druze community"